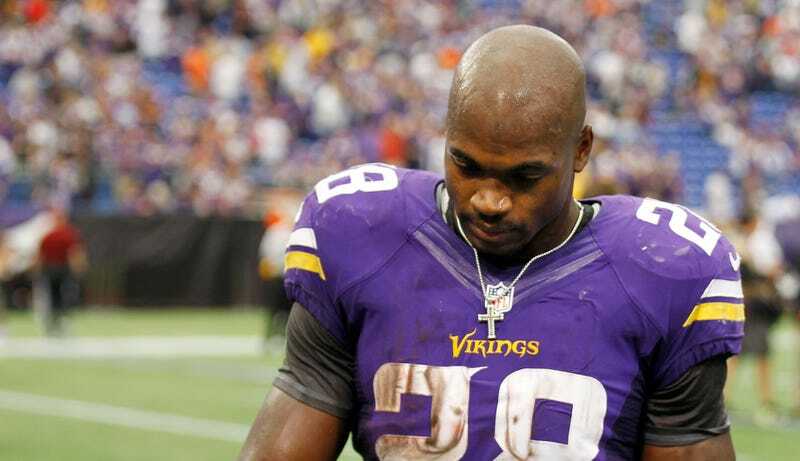 The 2-year-old son of Adrian Peterson died today, according to Sioux Falls police. The boy was allegedly beaten by his mother's boyfriend on Wednesday, and had been unresponsive and in critical condition since. Earlier reports had the family planning to take him off life support today. Reports: Adrian Peterson&apos;s 2-Year-Old Beaten, "Not Expected To Survive"
The suspect, Joseph Patterson, has a history of domestic violence charges. He remains jailed on $750,000 cash bond, and has been charged with aggravated assault and aggravated assault on an infant. The district attorney's office is now considering additional charges. The boy is reported to be Peterson's son via a woman who moved to South Dakota from the Twin Cities a couple of years ago, and Peterson's paternity had been in doubt until a recent paternity test. Police have withheld the child's name, but this afternoon said they would release it next week. Peterson said earlier today that "I will be playing Sunday...without a doubt."